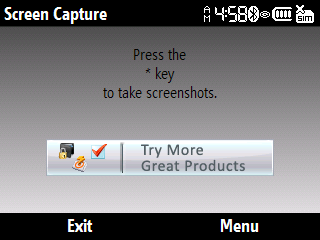 Screen Capture freeware for smartphone, Windows mobile phone free downloads. Ilium Software Screen Capture is a free, fast, and easy screen capturing program for your Windows Mobile Pocket PC or Smartphone. Download a copy today and you'll be able to take screenshots quickly, whenever you need to! Will not install on the Samsung ACE via Sprint. Great tool, only it doesn't take screenshots of java apps. I need something that will save screen capture images while running Opera Mini, & other java powered applications. Thank you. the program installed successfully, but i have no idea how use it. doesnt want to install on a HTC touch diamond 2.. Runs great on the Motorola Q9C. Great app. love it. works great on my t-mobile dash, Thanks. This software is not wanting to download on the Nokia Lumia 710.. Can you guys PLEASE get this up and working for my phone? Thanks.